This is an image of Trans-Amazonian Highway running from east to west in Para, Brazil, and scars of fishbone-pattern deforestation spread around it like fish bones in tropical rainforests. Dark green indicates tropical rainforest; light green, grass or pastures; black, rivers, lakes, or no data; and reddish brown, little vegetation like bare land or bare rock. The Amazon River flows from east to west in the north of the image covered with white clouds; Tapajos River (left), Iriri River and Xingu River (center), and Tocantins River (right) run south from the Amazon River. 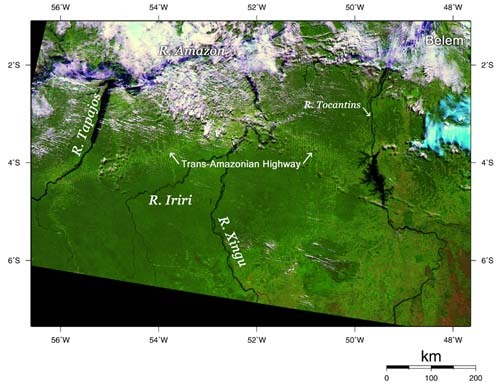 The Trans-Amazonian Highway is seen as a light green line crossing those rivers in the center of the image. Tropical rainforests in the Amazon make up 30% of the world's rainforests and play an important role as the "Earth's lung," absorbing carbon dioxide and generating oxygen. However, it is said that 17,000km 2 of rainforest, approximately the same area as Shikoku, has disappeared every year for the last 20 years. In 1960's, the Brazilian government encouraged farmers to colonize the Amazon and built the 5,500 km Trans-Amazonian Highway by cutting down the primary forests. The colonists cut down forests again and again to break new ground, and when the ground lost its productivity, it was burned and was developed as pastures. As a result, tropical rainforests disappeared gradually from the roadside, creating fishbone-pattern seen in the image. While the Brazilian government promotes forest protection measures today, forests are still being cut down and burned. For the farmers living in the Amazon, that is necessary as a livelihood and a basic agricultural technique for clearing their land. More cooperation from developed countries is required to resolve this dilemma. The above false color images were composed using spectral channels 28 (1640 nm), 23 (825 nm) and 22 (660 nm), wavelengths ranging from visible to the short wavelength infrared region. The image was acquired on May 19, 2003.